I&P and FERDI (Foundation for Studies and Research on International Development) carried out a study on the social and economic impacts of employment and explored the impacts of an employment contract in the Senegalese context. Over 200 employees were interviewed in 6 portfolio companies, covering several sectors, hierarchical levels and types of contractualization. Golden Nuts and Grain is a Senegalese company specialising in the production of natural juices made from local products such as bouye, bissap and ginger. Marketed under the GOUT D'OR brand, the products combine the know-how inherited from Senegalese traditions with international standards. In this way, they contribute to the improvement of the food quality for Senegalese people while enhancing the value of local products. GOUT D'OR juices are already sold in three hundred local sales outlets in Dakar. The company was founded in 2016 by Oumar REMY, a unique promoter. He holds a degree in international trade. He then went on to earn a bachelor's degree and then a master's degree in commerce & international affairs in France. Back in Senegal, the current manager of Gout d'Or started his entrepreneurial career in November 2007, first with the establishment of A2Z COMMUNICATION SARL, a company specialized in the distribution of communication media and advertising objects. Then, he joined the groundnut sector as an intermediary on behalf of major industrialists. Finally, in September 2016, he created Golden Nuts and Grain. • Accelerate the company's growth trajectory by providing it with financial, technical and human resources to strengthen its base and seize market opportunities. • Support the company in its strategy and in improving the efficiency of its organization. • Structure and support the development of management methods and tools, support the setting up of a new production unit and its implementation. • Tax formalization and payment of VAT and other applicable taxes and duties. • Support in the implementation of effective governance and commercial, financial and administrative management tools. The Dental Clinic Le Cap Vert is a Senegalese health structure created in 2006 and specialized in oral care. With proven expertise, the clinic offers its patients high quality oral care services, performed using processes and equipment that meet the highest standards in the dental field. It includes several specialty areas: basic dental care, orthodontics, prostheses and dental imaging. After twelve years of activity, the Dental Clinic Le Cap Vert has several thousand patients treated, enjoys a very good reputation for the quality of its services, and has made significant progress in its operational and financial performance. Dr Issakha Mbaye is a dentist. He graduated in 2003 in dentistry from Cheikh Anta Diop University in Dakar, and also holds a diploma in public health. • Support the company in its growth phase by providing it with financial, technical and human resources to strengthen its base, expand its offers and seize development opportunities. • Provide local support ranging from strategy to improving the effectiveness of the management of the organization. • Provide quality care to a greater number of patients. Investisseurs & Partenaires (I&P) est un groupe d’impact investment s’adressant exclusivement aux PME africaines. Depuis 2002, I&P a financé et accompagné plus de 90 entrepreneurs dans 16 pays d’Afrique subsaharienne : Sénégal, Mauritanie, Mali, Bénin, Niger, Burkina Faso, Côte d’Ivoire, Cameroun, Madagascar, etc. (voir notre site : www.ietp.com). The Centre d'Appui à l'Initiative Féminine (CAIF) is a vocational training centre specialising in catering, hotel trade, sewing, styling, and hairstyling. Created 14 years ago, CAIF has developed a strong expertise to offer its trainees, mainly young Senegalese women, good quality training adapted to the job market. Mrs Arame Dramé is the founder of CAIF, which she directed from its creation until 2016. Today she remains active in the structure and uses her reputation and experience to have training contracts with institutional partners. Ms Dramé is an expert in educational issues and worked from 1989 to 2016 at the Institut National d'Etudes et d'Action pour le Développement de l'Education (INEADE) where she focused on vocational training and the issue of deschooling of young people in Senegal. She holds a DUEL 2 degree in English from UCAD and an Entrepreneurship Training Certificate from SODIDA. Since 2016, the school is directed by Insa Seydou Dramé, son of the founder and promoter of the project. He decided to join the family business in 2012, where he successively held the positions of Interim Managing Director for 2 years, Director of Continuing Education and External Relations and Director of Operations. He previously worked for Huawei Technologies as a front office engineer. He holds a DEUG in Science and Technology for Engineering from the University of Paris 13, and a Professional Master from the African Institute of Management (IAM) of Dakar in Project Management. • Governance: implementation of financial and administrative management tools, formalization of procedures. SENAR Les Délices de Lysa is a Senegalese company specializing in the processing and marketing of agricultural products such as peanuts, cashew and corn.It has long-standing expertise in providing its customers with healthy, natural products of high taste quality, elaborated with local raw materials processed by artisanal processes. SENAR products are mainly marketed in major retail chains in Senegal (CASINO, AUCHAN, EXCLUSIVE, CITYDIA, etc. ), in hotels (eg NOVOTEL), and in direct sales to private individuals in Dakar ( eg Dakar Farmers Market). Sylvie Sagbo Gommard took over the management of the family business in 2015 to ensure its development and sustainability. In 1982 her mother Mrs. Sagbo was the first to market her peanuts in supermarkets in Dakar. She built her own company and now has more than 10 employees working tirelessly to supply the Senegalese market with the best peanuts and cashews. • Support the construction of a new factory abiding international standards and leading to increasing production capacity. COGELEC ENERGY is an engineering company based in Dakar, Senegal. The company is present in electrical engineering and line construction works, rural electrification and distribution of electromechanical equipment. COGELEC ENERGY is focused on bringing energy for productive uses to rural areas in Senegal for the greater benefit of the Senegalese population. Within rural electrification, COGELEC ENERGY focuses on providing the most economical energy possible for productive use in rural communities, with a particular focus on bore wells in remote locations. COGELEC ENERGY’s clients include governments with whom they partner long term to provide electricity access and services for rural areas, as well as industrial companies looking for the most economical solutions to build conventional grid connections or using renewable energy. Cogelec Energy is managed by Abdou Wahab Kane. OuiCarry provides delivery services and allows its customers (individuals and businesses) based in Senegal to buy products from international commercial websites. The clients can choose from any commercial website, which gives them access to very wide range of products. For those without credit card, OuiCarry can buy the product online on behalf on the client. OuiCarry currently counts several thousand customers and has made good progress over the last few years. The company was rewarded in 2016 by the Orange FAB prize and has also been the finalist of the “Great Entrepreneur Competition” held by the British Council. 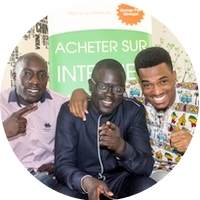 OuiCarry was co-founded by three entrepreneurs: Olabissi Adjovi, Youssou Ndiaye and Pape Oumar Yam. Olabissi Adjovi grew up in Benin and moved to France to study at the National Institute of Applied Sciences in Lyon. He holds a Master on entrepreneurship from ESCP Europe. Youssou Ndiaye graduated from Lyon’s Ecole Polytechnique. Before working for OuiCarry, he co-founded and managed Speed Mail Service, a mailing company dedicated to Senegalese businesses. Pape Oumar Yam graduated in economics and transport management from the University Of Economic Science Of Montpellier. He came back to Senegal in 2009 and became soon associated on Speed Mail Service and OuiCarry projects. Nest is a medical network settled in Senegal, offering a complete monitoring of woman and young child. Founded in 2012, NEST provides a complete monitoring of woman and children thanks to a pediatric and maternity hospital. NEST offers high-quality health services at reasonable price, primarily aimed at middle classes. Accessible 24/24 and 7/7, NEST puts a particular emphasis seeing and listening to patients, and allows young women of child-breeding age to be followed until the birth, and a follow-up of their children until they are 15 years old. This model, inspired from the Indian private chain of maternity hospitals Lifespring Hospital, is particularly relevant in Senegal, where local medical offer is shared between expensive private clinics and public infrastructures suffering from a lack of technical means and standards. NEST embodies a gap-filling role within this market. Khadidiatou Nakoulima grew up in Senegal and graduated from Mines de Paris in 2009. Several members of her family working in the medical field, Khady is deeply aware of the health issues in Senegal. She founded NEST in 2012 with the help of her father, Alassane, her brother Ousseynou and Dr. Adboulaye DIOP, gynaecologist. Khadidiatou currently manages the company. She aims at establishing a health network dedicated to woman and children in West Africa for low and middle-income populations.